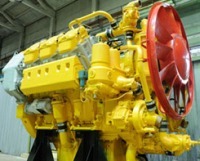 Ural Diesel Engine Plant (UDMZ, is a subsidiary of "Sinara-Transport Machines") has successfully completed the development work carried out and acceptance testing of a prototype diesel 12DM-21L for use as a power plant on the main locomotive for TG16M Sakhalin Railway (1067 mm gauge). Recall that Sinara Group and the "Russian Railways" in May 2012 signed an agreement to supply diesel locomotives TG16M. Under the contract, holding "Sinara-Transport Machines" has committed up to 2016 manufacture and transfer of JSC "Russian Railways" 40 mainline locomotives TG16M articulated. For acceptance testing of the new diesel engine 12DM-21L acceptance committee was formed, consisting of representatives of JSC "Russian Railways" OJSC, "Lyudinovskiy Locomotive Plant" LLC, "CIR STM", "Scientific-Research and Design-Technological Institute of the rolling stock." The Commission was headed by Boris Grosman — chief designer of the department of new locomotives and operational tests Design Bureau JSC "Russian Railways". The members of the commission, signed the instrument of acceptance tests, conducted by noted completeness development work and quality preparation of the plant for testing. At the joint meeting discussed issues of cooperation between the plant and the Railways for the supply of diesel engines of the series until 2020. The plant plans to produce a series of mounting 12DM-21L diesel engines of 100 vehicles.